One of the leading reasons as to why WordPress is so hugely popular as a Content Management System (CMS) is that there are literally thousands of off-the-shelf themes for users to choose from. Along with the standard free and paid options offered within the WordPress customizer tool itself, sites such as ThemeForest have a huge array of independently created themes which WordPress users can buy, download and use in just a few clicks. 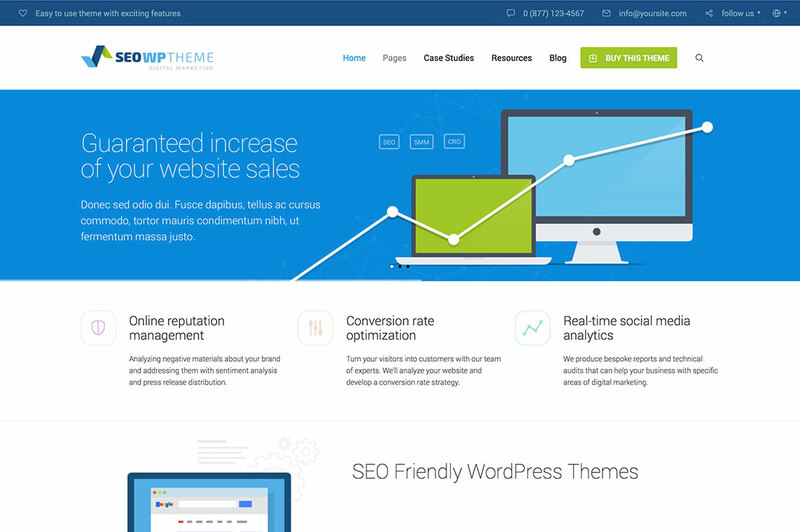 But, many of these awesome looking themes claim to be ‘search engine optimized’ – a fact that isn’t always entirely true. So, what should you be taking into consideration when it comes to choosing a WordPress theme that will good for your SEO? Let’s take a look at the facts. If you want a WordPress theme that is SEO-friendly, the first thing you should do is avoid any theme which does not have a responsive design. The harsh truth is that no matter how stunning a theme may look when it is viewed on a standard desktop, if the design isn’t responsive it is quickly going to lose both aesthetic value and navigational ease when it is viewed on another device such as a tablet or smartphone. Search engines also take the mobile-friendliness of a site into consideration when determining rankings – with more and more people choosing to browse from their smartphones, making sure that your theme is responsive is an absolute must. The performance of your website is also used as a significantly important ranking factor by Google and other search engines. Simply put, you could grab yourself a theme that has the best looking design in the whole world but if it is slow to load and navigate, Google won’t give a damn about how stunning it is. Whilst your website host plays a pivotal role in the speed of page loading, choosing a theme which is quick to load is also very important. In order to ensure that you don’t make a mistake when you choose a theme and end up with a slow one, use a tool such as GTMetrix to run a live demo of the theme. When you are choosing a WordPress theme, it’s essential that you opt for one which supports a range of plugins to improve your website’s SEO. There are a variety of plugins available which can help you to best optimize your WordPress site for search, and the best thing about them is that they don’t usually require the user to have any knowledge of web development or coding. When you choose a theme it’s important to ensure that it is fully compatible with any WordPress plugins for SEO that you plan to use. For more information on effective SEO for your WordPress site, visit the experts over at clickintelligence.co.uk. What do you take into consideration when you choose a WordPress theme? What advice would you give to first-time WordPress users looking for a theme that is useful and effective? We’d love to hear from you in the comments.